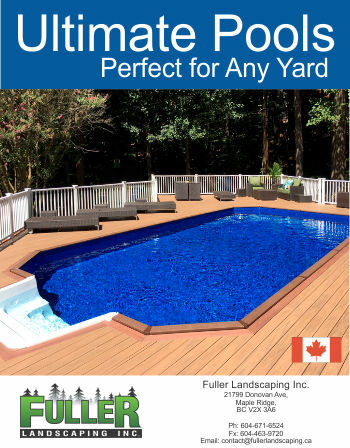 Pools - Fuller Landscaping Inc.
Take your landscaping to the next level! Or take your yard to the next level with a spectacular in ground or above ground pool. At Fuller Landscaping offer a wide variety of Pools and Water Features. Our in ground or above ground pools offer a cool space for entertaining in the summer and a lifetime of enjoyment end memories for the kids. Check out our brochure for more details. The Ultimate pool can be installed above ground, partially in-ground, or completely in-ground to fit any yard or slope. The 14 gauge in-ground quality steel gives the pool unmatched strength and durability to last a lifetime. Beat the heat in the summer and ensure your backyard is the envy of the neighbourhood. Installing a pool is a BIG decision! Let us help. We’ll spend the time to carefully review all of the options available and work closely with you to design the perfect fit for your lifestyle and yard design. Determining whether an above ground pool or in ground pool is the right choice for you can be a matter of budget or fit for the yard space and design. At Fuller Landscaping we take an holistic approach, and consider all of the implications the carefully explain your options and make recommendations to fit your budget and needs. Call today and get started on your new lifiestyle!